Disclosure: In exchange for my post and to facilitate my honest review of this experience, I received tickets to the event for my family. No other compensation was received and all opinions expressed are my own. Calling all really useful engines! 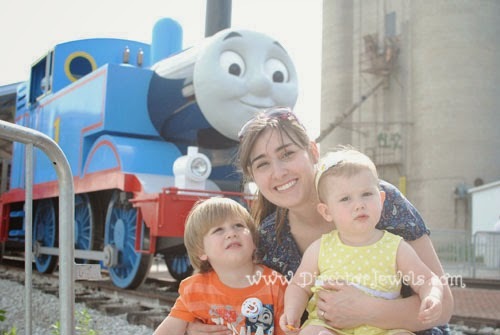 Thomas the Tank Engine is touring the country right now, taking little engineers on exciting train rides - and we had the chance to experience this fun again this summer! When we rode Thomas last year, Lincoln was recovering from his coffee burn, so we had to be pretty cautious while adventuring. 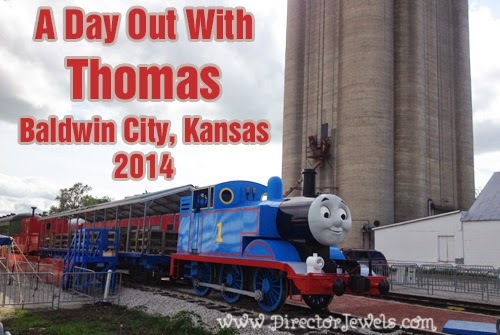 This year, our Day Out With Thomas at Midland Railway in Baldwin City, Kansas was nothing but fun! 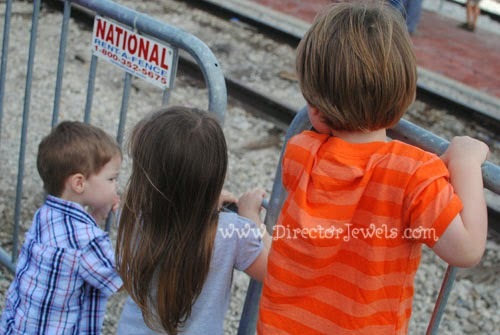 The Thomas experience is fun for kids of all ages. On top of the train ride, guests can experience Thomas & Friends themed entertainment - things like Storytelling and Video Viewing, Temporary Tattoos of Island of Sodor friends, an Imagination Station with Arts & Crafts and more. Guests also get the chance to meet Sir Topham Hatt, the Controller of the Railway on the Island of Sodor. Lincoln was really excited when he spotted Sir Topham Hatt and we waited through the line to take a photo with him....however as soon as it was our turn, Lincoln freaked out and ran away. Maybe next year! 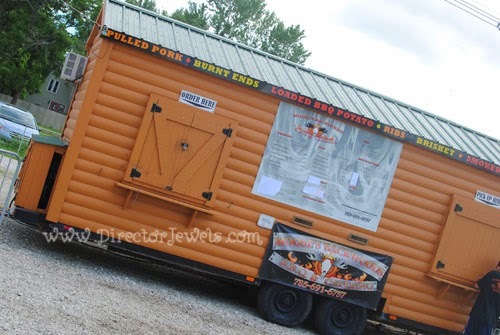 The stop in Baldwin City also showcases some local food vendors - and the BBQ from this little trailer is delicious (and reasonably priced)! 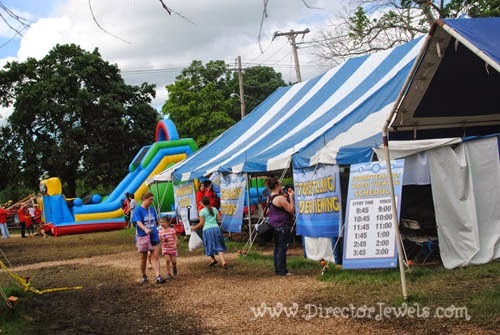 We didn't take advantage of most of the activities because the Kansas City metro had been treated to a crazy deluge of rain earlier in the weekend and the grounds were extremely muddy. We waded through once just to get to the picnic tables and then to the restroom, but that was about all we (and our shoes and strollers) could handle. Our tickets were held at will-call and it was a simple process to pick them up (just needed the confirmation number from our order). 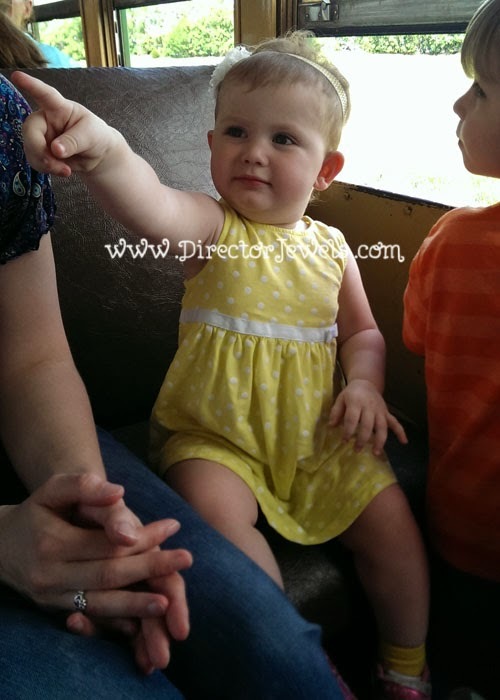 We had planned for this to be a family outing, but our Daddy was not feeling well, so I invited my friend Stephanie from Moments That Take My Breath Away and her kids to come along with us. 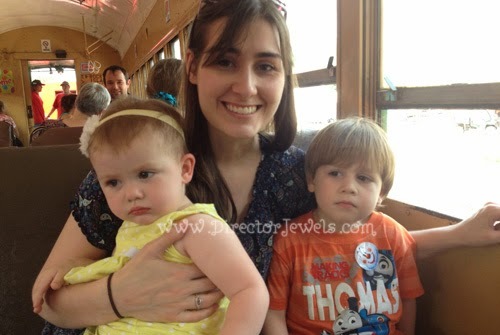 Two moms and four toddlers on a train ride adventure? We said multiple times that we might be crazy, but it worked out really well. We had a family 4-pack of tickets, but since Addie and Connor are under two years old, they were able to just ride on our laps with no tickets. 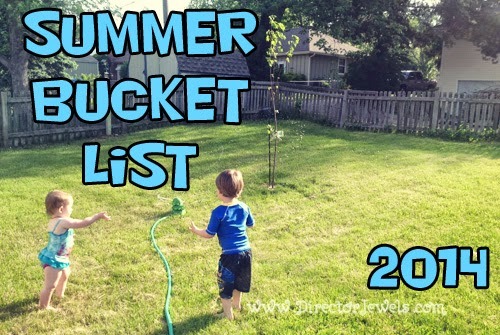 Realistically, they stood in between the seats and climbed on their siblings and tried to crawl out the windows. But officially, they were lap riders. 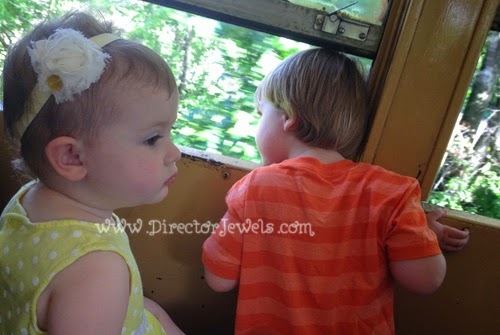 The kids were all so excited when the conductor called "All Aboard" and we headed into the train at Midland Railway. 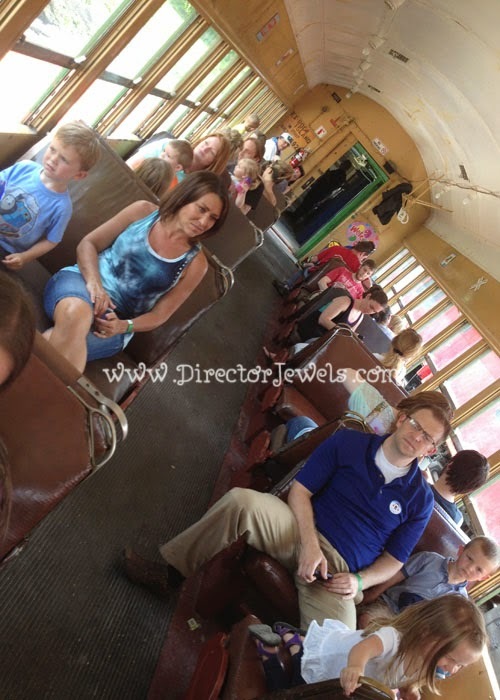 It is a vintage train that's so fun for this experience! The atmosphere is very family-friendly (there's even a place to park strollers during the ride), so thankfully we didn't get any dirty looks when our kids tried to run away or climb over our seats. Lincoln normally doesn't appreciate things that require him to sit still, so I wasn't sure how he would do on a 25-minute train ride. He surprised me and sat patiently through the entire ride! He was way more into it this year than last - he had a huge grin on his face for most of the ride and spent the last portion with his face out the window, hair blowing in the wind. 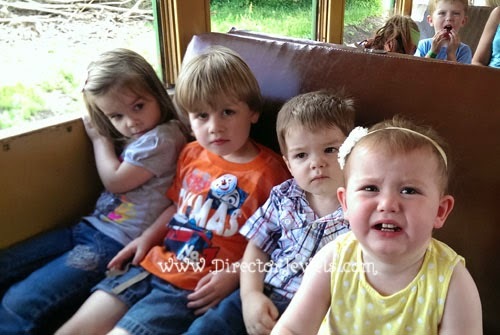 Four kids on a train. They were all actually happy...we think. 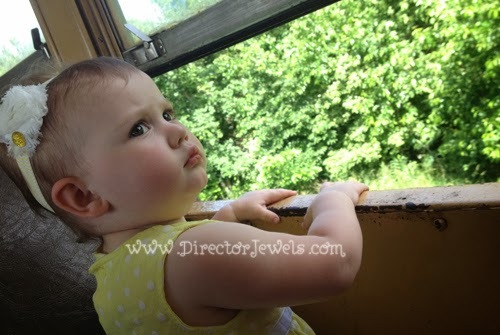 It was a pretty relaxing ride for Stephanie and me, since the kids were all relatively happy and content to just look out the windows and shout "CHOO-CHOO" from time to time! 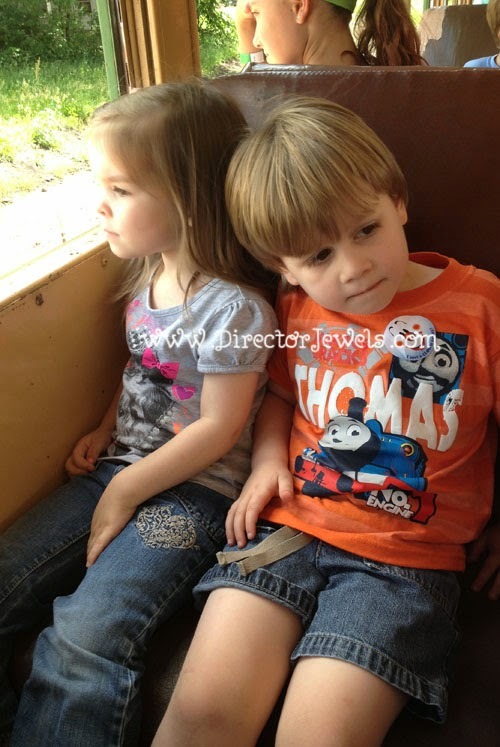 We were given certificates for each child that stated they had been on a ride with Thomas. One of the best moments of the trip was when we were all told that we needed to tell Thomas to pull us back to the station. Everyone shouted "Pull, Thomas!" and the kids were just giddy when we headed back with Thomas leading the way. 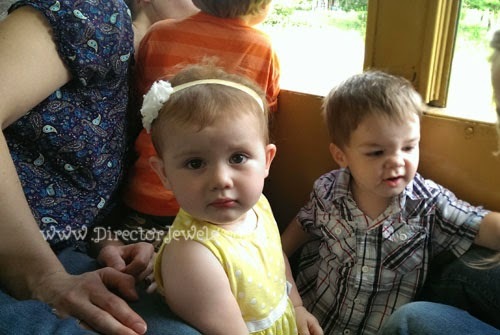 Lincoln's friend Grace said that was her favorite part of the ride! 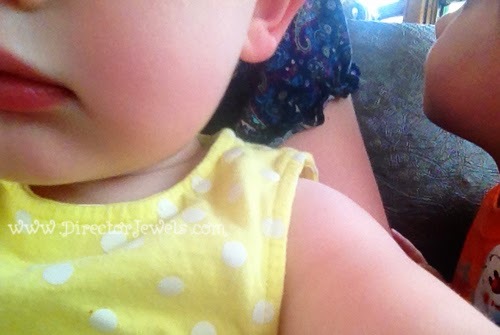 Addie spots a train on the wall. After our ride, we waited in line for our turn to take photos with the True Blue Engine, himself! It was a lot of fun having friends along for the journey. 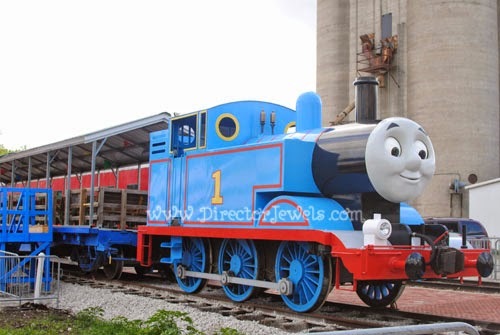 Thomas has already chugged out of the Midland Railway station for 2014, but you can check out the full tour schedule and upcoming cities. Have you ever taken a ride with Thomas? It's so much fun!